One of the things I struggled with for a long time was eating to fuel my workouts. It felt like all the advice on healthy eating was aimed at weight loss for inactive people, and it was really hard to find advice on reaching or maintaining healthy body weight and composition if you were active. If you’ve ever tried trying to train for a Half Marathon and train for Roller Derby for over 2 hours twice a week while sticking to a ridiculous 1200 calorie diet you would know exactly what I mean. I spent a lot of time feeling weak, faint or binge eating because I was starving. Over the last few years I’ve spent a lot of time educating myself, so I find it far easier, but I’m still always on the look out for great recipes that will help me reach my goals and feel awesome. 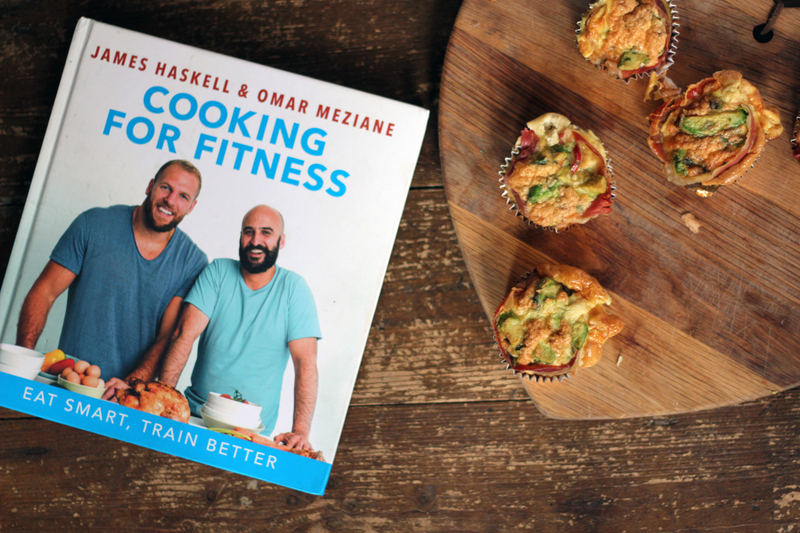 Enter this great new book that I was sent to review just before Christmas Cooking for Fitness by England Rugby player James Haskell and Sports Performance chef Omar Meziane. Today I’m going to give it a quick review, then read to the end for a sample recipe that I’ve tried out, and my first ever Instagram giveaway to win a copy of your own. This is more than just a cookbook, it’s a great starter resource for Sports Nutrition, and although it comes from James’ Rugby playing background is highly applicable to any sport. It starts with an introduction and a brief introduction to the concept of eating to fuel yourself for sport. It goes through the concept of macros, eating to gain muscle, eating for fat loss, a sample meal plan for a high-level athlete and even a section on kitchen and store cupboard essentials. Once you get into the recipes they are split into Breakfasts, Lunches, Dinners and Snacks, and then further subdivided into High and Low Carb, or Pre and Post Training, for snacks. I loved this layout as it gives you the option to pick high carb meals to cook on training days and select meals according to your goals. Each Recipe also contains full nutritional information and a bar code to scan into My Fitness Pal which was a revelation that I was frankly far too excited about. Over the last couple of weeks I’ve cooked 2 or 3 recipes from the book, and they’ve all been easy to prepare, though they can require quite a few ingredients and a lot of chopping! We even had potato cakes from one of the recipes for breakfast on Christmas morning, so these definitely aren’t healthy recipes that will leave you feeling deprived! If I had any quibbles with then book it would be that some of the ingredient measurements aren’t very precise. “2 or 3 Medium potatoes” for instance, seems to give a lot of wiggle room for a recipe that is supposed to be macro counted, and I’d rather be given a rough weight of potato. If you are not an elite athlete, like many of us I suspect, then you may also find the calorie and macro counts of some of the meals on the high side. Many of the lunches can easily do double duty as dinners for me and I probably couldn’t eat a meal from the book for all 3 meals a day unless I also wanted to spend 6 hours in the gym (which I don’t, I love the gym, but I also love my sofa). 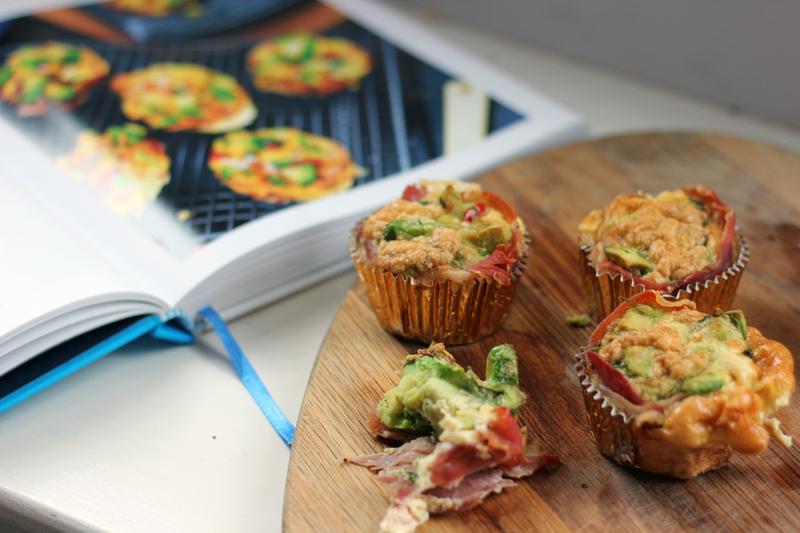 Today I’m going to share with you one of the easiest recipes I’ve made from the book. 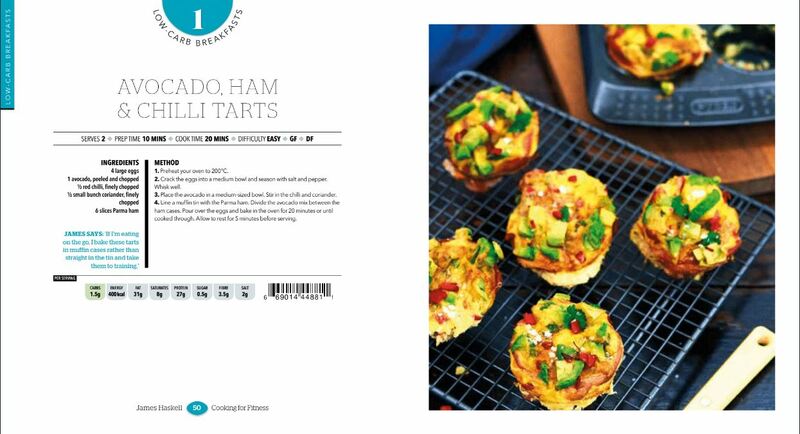 Avocado, Ham and Chilli tarts. You can see the sample page from the book with the recipe above. Crack the eggs into a bowl, season with salt and pepper and whisk well. Place the avocado, chilli and coriander in a bowl and mix well. 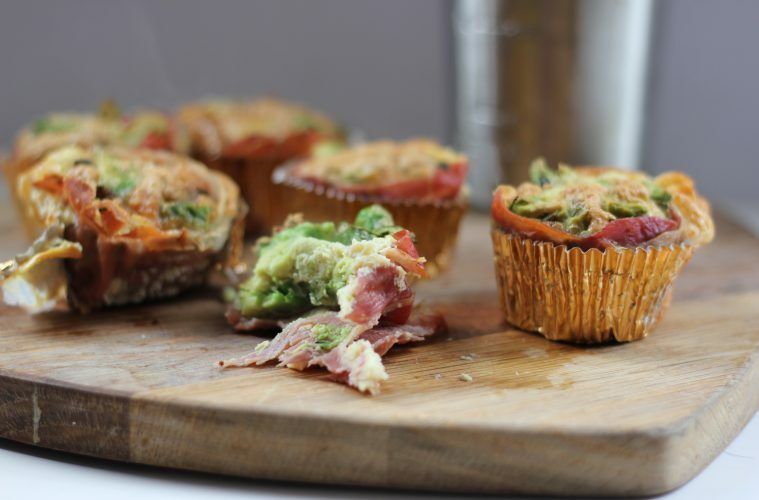 Line a Muffin tin with the parma ham, divide the avocado mix between the cases and then fill with the egg. Bake for 20 minutes or until cooked through and allow to rest for 5 minutes before serving. As you can see from the photos, I took some advice from the book and lined my Muffin tin with paper cases (Gold paper cases, obviously), this means that this little tarts are easily transportable and ideal to take to away games, or early practices, or any other time you might need breakfast on the go. If you want to get a copy of your own then you can grab it at Amazon here, or alternatively you could try your luck winning a copy in my first ever Instagram giveaway!